Mike Smith has been a map librarian for almost twenty years, the last seven of which he’s spent at UCSD where he’s also the GIS coordinator and the state and local documents librarian. When UCSD began a reorganization process, Mike and a few other librarians started organizing their colleagues around some of the issues they had with the proposed management and reporting structure. Mike has a family history in the academe and in social justice; his father was a professor and friend to Martin Luther King Jr. Mike see’s his organizing work in the library as a natural outcome of the values he was raised with. Insider: UCSD libraries are in the process of reorganization. What are the issues that librarians are concerned about as these changes happen? M.S. : There are several issues, but the two biggest which have emerged are: 1) the “efficiency and nimbleness” of the new organization and 2) workload and morale. Insider: Recently, you and about twenty other librarians signed a letter addressed to the UL demanding that the University negotiate over some of the changes and their effects on librarians. What caused so many librarians to step forward at this point? M.S. : Librarians are coming to the realization that the re-org isn't working well and that our input is really necessary. While the library reorganization had been in the planning stages for quite some time, it didn’t officially go into effect until July 2013. On May 30th, a few librarians with our UC-AFT rep. met with campus Labor Relations and library administration to discuss the reorganization, and particularly the structure where a librarian could be assigned to as many as four different programs. We emerged from that meeting with a verbal agreement over how the new program structure would work, specifically with regards to supervision. In September, librarians met to discuss how things were going and we outlined several issues and concerns that breached the terms of the agreement made at our May meeting. We requested another meeting with Labor Relations and library administration, but by early January this meeting still hadn’t occurred. We did have a meeting scheduled for February, but we anticipated that this meeting might be cancelled like prior meetings, which prompted our letter which stated “Further cancellation, delay, or postponement is a repudiation of our agreement and will be interpreted as a refusal to bargain over the changes in the terms and working conditions of Unit 17 Librarians that have been caused by the reorganization.” The letter seems to have worked becasue our scheduled meeting with Labor Relations and library administration finally occurred on February 19th. I'm hoping we have now established a better line of communication. Insider: How does it feel to have brought your co-workers together in an effort to ensure long-term success of the libraries at UCSD? M.S. : Having such a large group respond to our call by signing on to the letter to the UL has been a really important moment for the librarians at UCSD. So it feels really good and I’m happy to be a part of the process. I must give some credit to our UC-AFT rep, Honora Keller. She has been instrumental in bringing us together, gathering information, and moving us forward. Insider: Now that you've finally met again with the library administration, do you think there will be improvement in the areas of concern you mentioned above? M.S. : We understand this is a long process and we are in a “shake out” period. An all staff survey was completed February 28th and represented librarians will be very interested to see the results and admin’s response. We hope there will be substantial changes to the program structure in the coming months and we will continue to be vigilant and involved in the process. One thing, which should help with regard to workload concerns, is the library is hiring again, including several librarian positions. 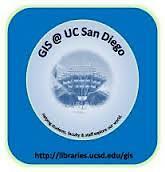 Insider: You're the Map Librarian and GIS Coordinator at UCSD. There must be a lot of departments on campus using GIS these days. M.S. : Yes, GIS is very multi-disciplinary. While UCSD does not have a geography department, we cater to many departments and programs, such as urban studies, political science, economics, business, oceanography and health care. GIS is another way to access data collections found in libraries, and many traditional map librarian positions began to add GIS as part of their job descriptions. Insider: Do you have a background in geography? M.S. : I have a B.A. and M.A. in geography and an M.L.S (from Syracuse—Go Orange!). After getting my M.A., I worked for several years in private industry and government doing GIS. Also during this time, I worked as a library assistant at the Justice Dept. in Washington, DC, and when I decided to go back to school to get an M.L.S., it was with the intent to become a map librarian. While at Syracuse I interned in the government documents and maps department in the university’s Bird Library. Upon graduation I was lucky to find a job quickly in a similar department at Northwestern University, where I worked for about 10 years doing maps, GIS and government documents. For about the last 7 years I have been at UCSD. I was originally hired as the map librarian, but have added the responsibilities as the GIS coordinator and the librarian for state and local documents. Insider: San Diego is a great place to live. What do you like to do when you’re not at UCSD or working in the library? M.S. 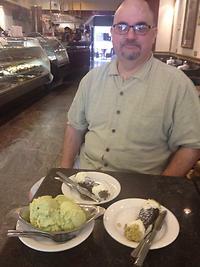 : I live near Balboa Park, and this is a great place to spend time. After the park, it’s usually time to check out San Diego’s wonderful beer culture with like-minded friends. 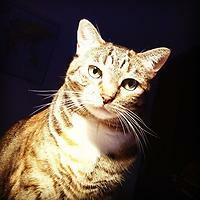 But I do tend to be a homebody and can often be found there with the world’s greatest cat, Ginger.